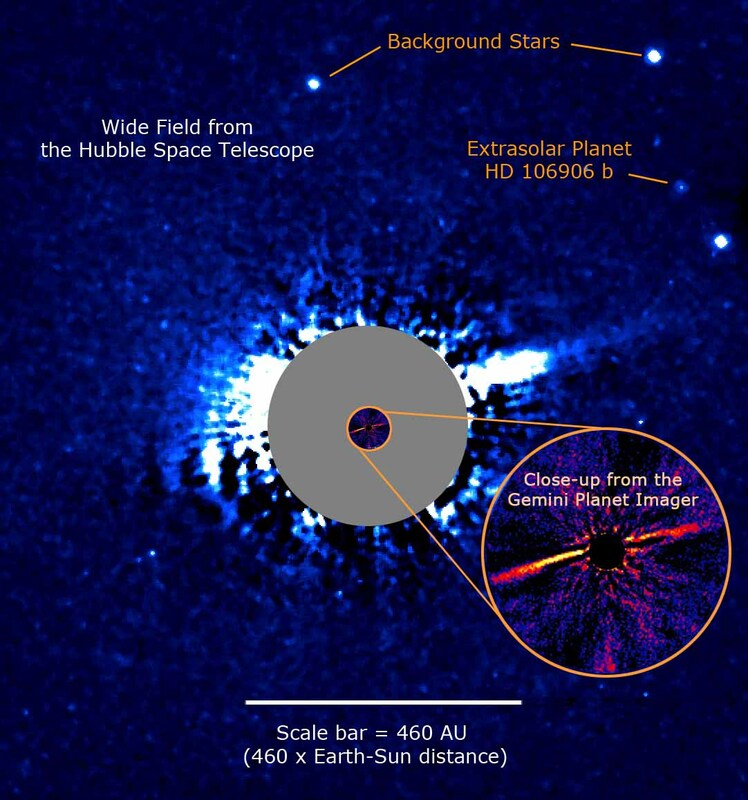 The Gemini Planet Imager Exoplanet Survey (GPIES) is an ambitious three-year study dedicated to imaging young Jupiters and debris disks around nearby stars using the GPI instrument installed on the Gemini South telescope in Chile. 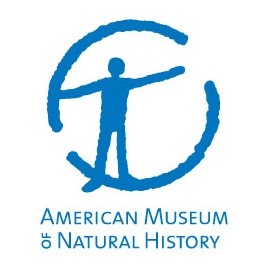 On November 12 2015, at the 47th annual meeting of the AAS’s Division for Planetary Sciences in Washington DC, Franck Marchis, Chair of the Exoplanet Research Group of the SETI Institute and a scientist involved in the project since 2004, will report on the status of the survey, emphasizing some discoveries made in its first year. 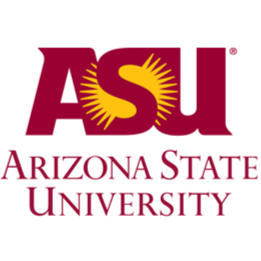 Led by Bruce Macintosh from Stanford University, the survey began a year ago and has already been highly successful, with several findings already published in peer-reviewed journals. The survey was officially launched in November 2014. 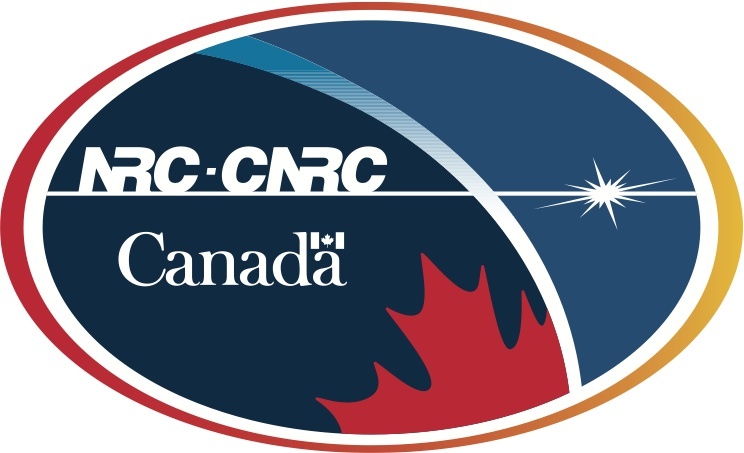 Eight observing runs allowed the study of approximately 160 targets, or a quarter of the sample. Other parts of the survey are more frustrating, though. 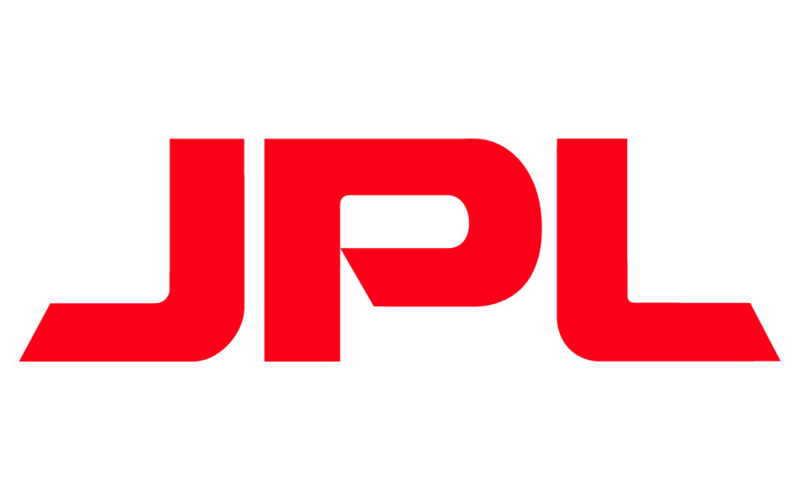 Due to the incipient El Nino, weather in Chile is worse than expected, with clouds, rain, snow, and atmospheric turbulence too severe even for GPI to fix. 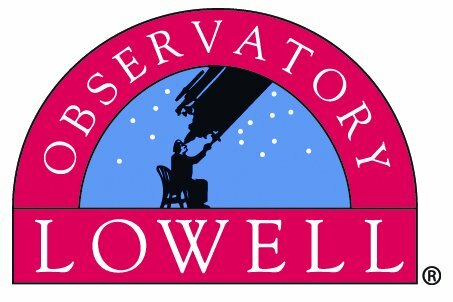 Since late June, out of the last 20 nights that team members have spent at the telescope, they’ve only gotten a few hours of good quality data Despite this loss, over which the team of course had no control, they have already published ten peer-reviewed papers in the last year. Two of the findings are described below. GPI data has revealed that 51 Eri b, the recently discovered Jupiter-like exoplanet around the nearby star 51 Eridani [http://www.gemini.edu/node/12403], indeed has an atmosphere of methane and water, and likely has a mass twice that of Jupiter. The team has continued to observe this planetary system, and observations recorded on Sept. 1, 2015, are most consistent with a planet orbiting 51 Eri and not a brown dwarf passing along our line of sight. “Thanks to GPI’s incredible precision, we can demonstrate that the odds are vanishingly small that 51 Eri b is actually a brown dwarf that has a chance alignment with this star. In fact it’s five times more likely that I’ll be struck by lightning this year than future data will show this is not a planet orbiting 51 Eri” said Eric Nielsen, a postdoctoral scholar at the SETI Institute and one of the authors of the paper recently accepted for publication in the Astrophysical Journal Letters [http://arxiv.org/abs/1509.07514]. Another author of this study, SETI Research Experience for Undergraduates student Sarah Blunt, analyzed the motion of 51 Eri b and found it to be completely consistent with a planet on an approximately 40-year orbit around its host star. 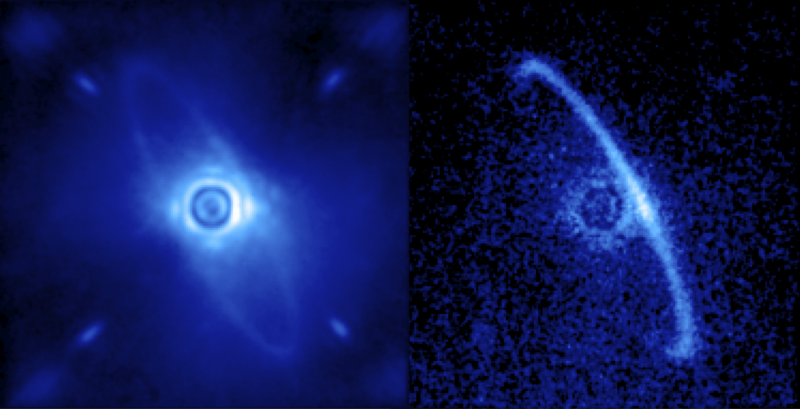 The team has also discovered and imaged disks of dusty debris around several stars. Astronomers believe that these are planetary systems that are still forming their planets. Some have complex structures because they host planets and fragments of the asteroidal and cometary materials that formed those planets. One such system is HD 131835: a massive 15 Myr-old star located 400 light-years from Earth. Using GPI’s high-contrast capability, the team imaged this disk for the first time in near-infrared light in May 2015. “The disk shows different morphology when observed in different wavelengths. Unlike the extended disk previously imaged in thermal emission, our GPI observations show a disk that has a ring-like structure, indicating that the large grains are distributed differently from the small ones. 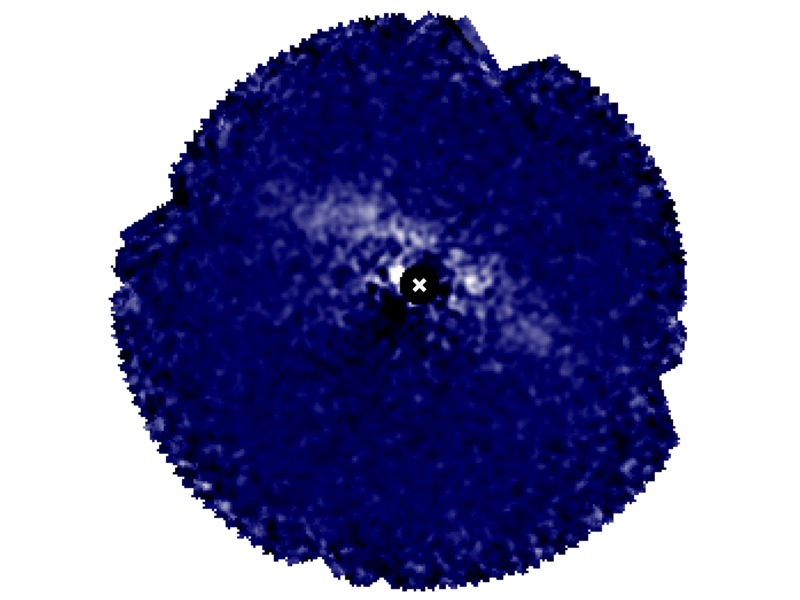 In addition, we discovered an asymmetry in the disk along its major axis. What causes this disk to be asymmetric is the subject of ongoing investigation, “ said Li-Wei Hung, a graduate student in the UCLA Department of Physics and Astronomy and lead author of the article submitted to the Astrophysical Journal Astrophysical Journal Letters. As asymmetries like the one seen in the system may be due to the gravitational influence of an unseen planet, more detailed observational study could one day confirm its existence. As the GPIES survey enters in its second year, we are collaborating with the Gemini Observatory to continue to improve the instrument. 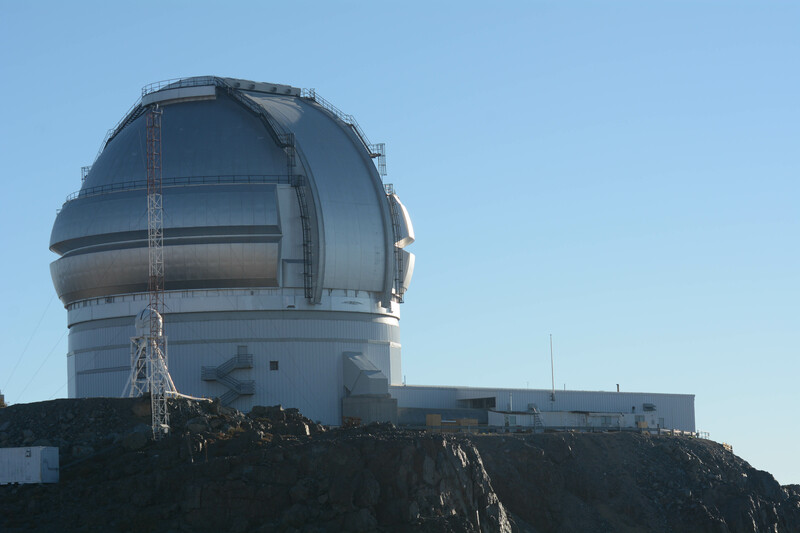 The Gemini South telescope primary mirror was recently re-coated with silver to improve reflectivity, and the GPI instrument was equipped with a new cooling system to optimize performance. “Continued collaboration between the Gemini Observatory and the GPIES collaboration has worked really well — we’re learning a lot about how it performs in the field and interacts with the atmosphere, and are working to make GPI an even a better instrument to see even fainter and closer planets,” said Bruce Macintosh, principal investigator of the project and professor at Stanford University. The GPIES team is led by the Principal Investigator Bruce Macintosh assisted by several Lead co-Investigators including James R. Graham, Travis Barman, Rene Doyon, Daniel Fabrycky, Michael Fitzgerald, Paul Kalas, Quinn Konopacky, Franck Marchis, Mark Marley, Christian Marois,Jennifer Patience, Marshall Perrin, Ben Oppenheimer and Inseok Song. 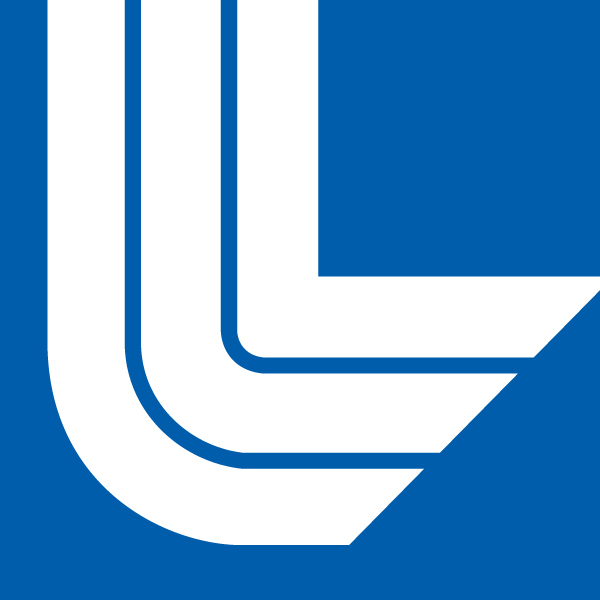 The entire team is composed of ~50 investigators, including several postdoctoral fellows and graduate students, from universities and research centers located in the U.S.A., U.K., Canada, Australia, Argentina, Brazil and Chile. The team meets regularly through the GPIES Science meetings whose first session was organized at the SETI Institute on October 11-13 2011, and the second one at the University of Toronto on June 13-14 2012. These meeting give an opportunity to the team to discuss the progress on the integration of instrument, design the observing campaign, organize the data processing and analysis pipeline, discuss the latest results in the field of exoplanets. The picture below shows the attendees at the first GPIES Science Workshop in June 2011. All members of the GPIES team have read and agree to abide by the policies set forth in the Gemini Project Policies Document. We committed to releasing fully processed images, including speckle suppression by our standard pipeline, in incremental releases approximately 18 months after the campaign begins. These are 5-sigma contrast levels achievable with different wavefront sensor sensitivity levels and one-hour integrations. The simulations are done over two R = 45 spectral channels, where the central wavelength is 1.65 microns and SDI has been applied over the 1.579-1.624 micron region. The dramatic improvement in contrast up to about 0.2 arcsec separation is due to speckle suppression. Click on the image to magnify. 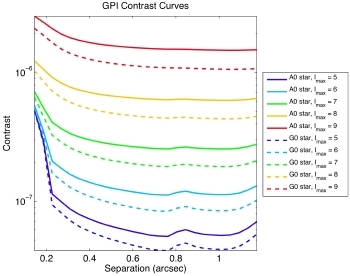 The combination of ADI (angular differential imaging) and SDI (spectral differential imaging) speckle suppression techniques greatly improves the contrast achievable with GPI. Contrast depends strongly on the performance of the wavefront sensor: for a star with a given I magnitude, a wavefront sensor that can lock on I = 9 stars will perform much better than one that requires I = 5 stars. Contrast also depends on the spectral type of the target star: since H band data will be taken, later spectral types will be brighter in H band than earlier spectral types for the same I magnitude. 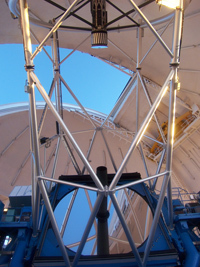 The Gemini Observatory is operated by the Association of Universities for Research in Astronomy, Inc., under a cooperative agreement with the NSF on behalf of the Gemini partnership: the National Science Foundation (United States), the National Research Council (Canada), CONICYT (Chile), the Australian Research Council (Australia), CNPq (Brazil), and SECYT (Argentina).